Again dawn tinged the ocean. A redder glow lit the river-mouth. Conan of Cimmeria leaned on his great sword upon the white beach, watching the Tigress swing out on her last voyage. There was no light in his eyes that contemplated the glassy swells. Out of the rolling blue wastes all glory and wonder had gone. A fierce revulsion shook him as he gazed at the green surges that deepened into purple hazes of mystery. Bêlit had been of the sea; she had lent it splendor and allure. Without her it rolled a barren, dreary and desolate waste from pole to pole. She belonged to the sea; to its everlasting mystery he returned her. He could do no more. For himself, its glittering blue splendor was more repellent than the leafy fronds which rustled and whispered behind him of vast mysterious wilds beyond them, and into which he must plunge. No hand was at the sweep of the Tigress, no oars drove her through the green water. But a clean tanging wind bellied her silken sail, and as a wild swan cleaves the sky to her nest, she sped seaward, flames mounting higher and higher from her deck to lick at the mast and envelop the figure that lay lapped in scarlet on the shining pyre. So passed the Queen of the Black Coast, and leaning on his red-stained sword, Conan stood silently until the red glow had faded far out in the blue hazes and dawn splashed its rose and gold over the ocean. 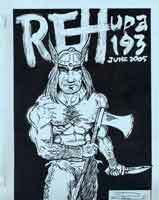 The latest REHupa arrived in early June, 156 pages. The a.p.a. is in the middle of a lull of sorts, as a few years ago 300+ pages was the norm. But the membership is full, and the a.p.a. shows no signs of going away. Longtime REHupans Carl Osman and David Burton both dropped out of the a.p.a., citing personal reasons that are taking up more and more of their time. But several new faces have stepped in to fill the breach. Don Herron, who has been in the a.p.a. twice before (the first time in its infancy, the next time around issue #100) is back yet again to help usher in REHupa’s #200 next August. A new member named Jim Dapkus has made some noise about joining, sending in waitlist money. We’ll have to wait until next time to see if he sends in a ‘zine and becomes a true-blue member. A buzz has started in the a.p.a. about the two big REH events happening next year, the extra-big REH Days in June and the World Fantasy Con in Austin, Texas dedicated to Howard in November. Patrick Burger, a member living in Africa, sends in an arch-academic piece on Howard entitled “Zusammenfassung: Progress on my Comparative Literature Dissertation on Robert E. Howard and Ernst Jünger (excerpt).” Gary Romeo offers a rebuttal to Steve Tompkins’ pointed, lengthy criticism of Romeo’s “Napoleon’s Triumph,” which appeared in The Cimmerian V1n1 in April 2004. Regardless of the merits of his arguments, Tompkins loses automatically just by virtue of his rebuttal appearing in the private halls of REHupa where no one who cares will read it. Romeo’s essay, however, has reached hundreds of readers, and in fact was voted 9th Place for Best Essay of 2004 by Cimmerian readers. Danny Street of England sent in the largest ‘zine this time at fifty pages. He writes a long examination of Howard’s character Cormac Fitzgeoffrey and offers dozens of pages of quotations from the stories about everything from what Cormac looked like to his biography to his personal conduct. Interesting for those people who like to have the details of Howard’s characters extracted and rearranged into logical categories. It brings certain aspect of the character into stark relief. Charles Gramlich weighs in with some mailing comments, those criticisms and discussion of other people’s ‘zines that forms a large part of the a.p.a. experience. Damon Sasser, publisher of The Definitive Howard Fanzine REH: Two-Gun Raconteur, announces the release of Issue #8 of that magazine, and touches on many aspects of the current Howard boom. Conan books, comics, and movies all are discussed. Dale Rippke presents the next in his line of fun essays on Howard’s Hyborian Age. Titled “Cartographic Curiosities: Stygia and the Black Kingdoms, Part 2,” he presents an all-new, very cool map of the Southern Continent of Howard’s World (basically prehistoric Africa) complete with representations of a dozen kingdoms most Howard fans have never seen on a map before, along with detailed reasoning for placing everything where he did. Conan fans out there would love to read this stuff, or see such a map in the books. Dale is planning on coming to REH Days in 2006 to give a panel on Hyborian Maps that should prove to be a lot of fun for Conan fans, so if you are coming down to Cross Plains in 2006 look out for that. Don Herron’s first ‘zine is “The Carter Collector Volume 1 – Number 1,” a somewhat serious, somewhat humorous look at the life and times of Lin Carter, an author well-known to Howard fans via his collaboration with L. Sprague de Camp on pastiches in the sixties and seventies. Chris Gruber’s minac ‘zine has a picture of a Windjammer circa 1927, which is probably what Sailor Steve Costigan’s ship looked like. Indy Cavalier has a trip report of the Windy City Con that was held April 23rd in Chicago, and says he found a copy of the Arkham House Skull-face for $175 sans dust jacket. Not a bad price at all. He also reprints a hilarious letter from an outraged reader in the Science Fiction Book Club newsletter, who can’t believe the SFBC would reprint one of those awful racist authors from the pulps. He wants a warning label to be placed on any material mentioning Howard in their newsletter. William Metcalf is his name, foolishness is apparently his game. Big Jim Charles, REHupa’s resident Kentucky redneck (and currently the only one of us who is a professional journalist) has a neat little article called “The Barbarian President: REH and Old Hickory” which compares REH’s barbarian characters to Andrew Jackson. Rick McCollum is finally back in the fold after a long hiatus, and offers a Minac ‘zine of mailing comments in his inimitable style. Newer member Jess Horsley talks comics, Morgan Holmes talks Donald Wandrei (Weird Tales author and co-founder of Arkham House). Mark Hall, editor of The Dark Man, gives us an Old English lesson (he’s an archeologist and can translate that language). James Van Hise offers his usual comics talk and reviews, while Frank Coffman discusses the interesting technology that allows people to make 3-D pictures from 2-D originals, and promises to show some interesting experiments with this technology applied to Howard photographs in the near future. Pretty Cool. He also hints that his book on Howard’s poetry, complete with many Howard poems, is nearing completion. Matt Herridge finishes things off with a warning on assuming that Howard’s writing is more biographical than it is. All in all a decent mailing, filled with interesting Howard stuff that the majority of fans out there will never see. 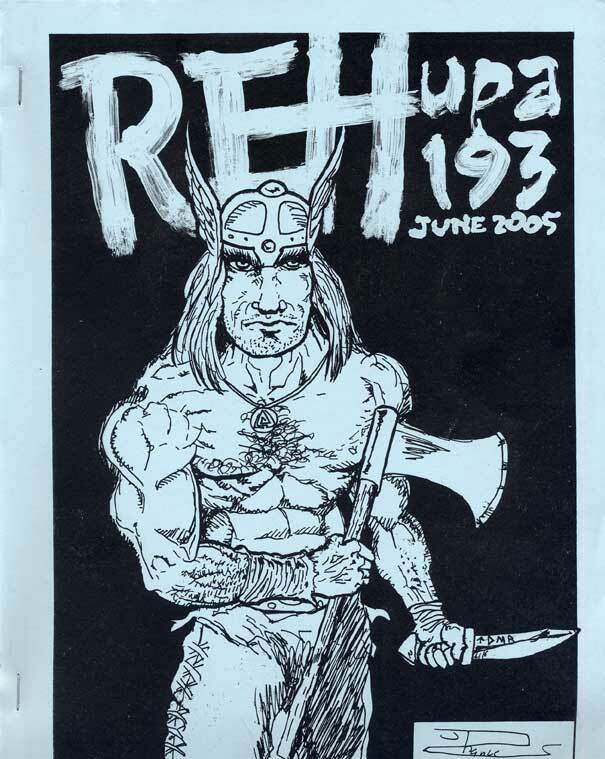 REHupa’s requirements aren’t very difficult: a mere two pages every four months is the minimum you need to write and send in to remain a member in good standing and receive mailings. Will any fans out there be tempted to give it a go, and in the process gain access to all of this Howard material in the mailings? In Cross Plains, at least two people said they were thinking hard about taking the plunge. Being a member is worth the price of admission, that’s for sure.